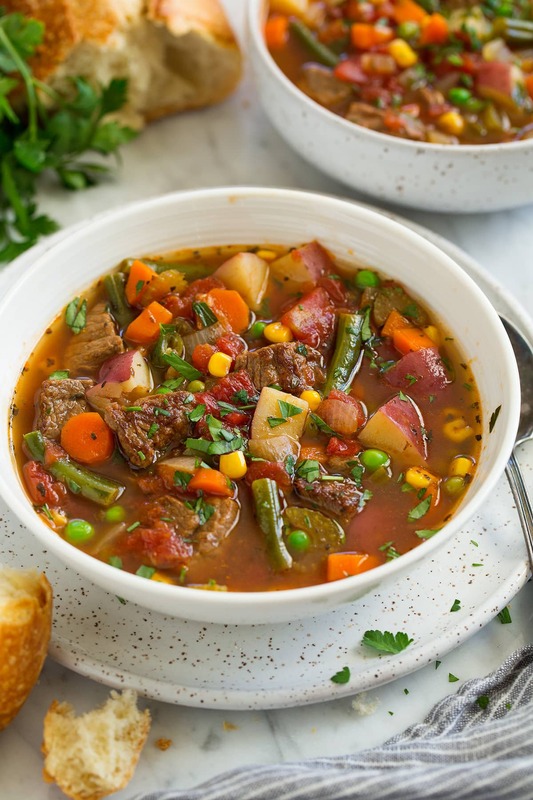 It might be the hottest month of the year but this Vegetable Beef Soup is the perfect way to use up all those summer veggies! It’s perfectly hearty and filling thanks to the abundance of vegetables and the tender chunks of beef. Plus it’s a versatile recipe so feel free to replace veggies with others you may have on hand. 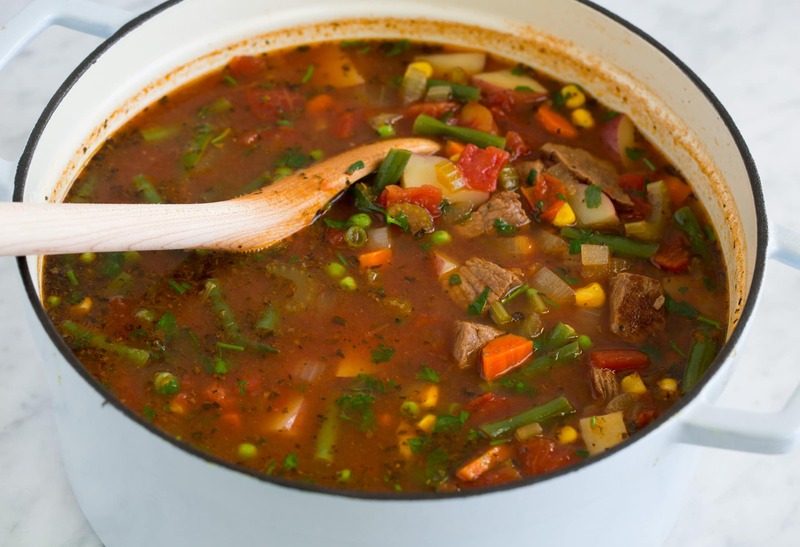 After simmering for an hour on the stove top this soup has such a delicious rich flavor and the beef is so deliciously tender. This is a perfect comforting fall and winter soup but when you’ve got lots of vegetables to use up in the summer this is the recipe to make! 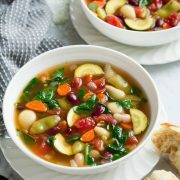 Want to see how easy this Vegetable Soup Recipe is? Watch the video! Note that the soup will be a little brothier than what’s pictures, I like to remove some of the broth so you can see the ingredients in the soup. But with that said you can use less broth if desired or even simmer the soup uncovered during cooking (just go easy on the salt). Heat 1 Tbsp olive oil in a large pot over medium-high heat. Dab beef dry with paper towels, season with salt and pepper then add half of the beef and brown about 4 minutes, turning halfway through. Transfer to a plate and repeat with remaining half of beef. Add another 1 Tbsp oil to now empty pot then add onions, carrots, and celery then saute 3 minutes, add garlic saute 1 minute longer. 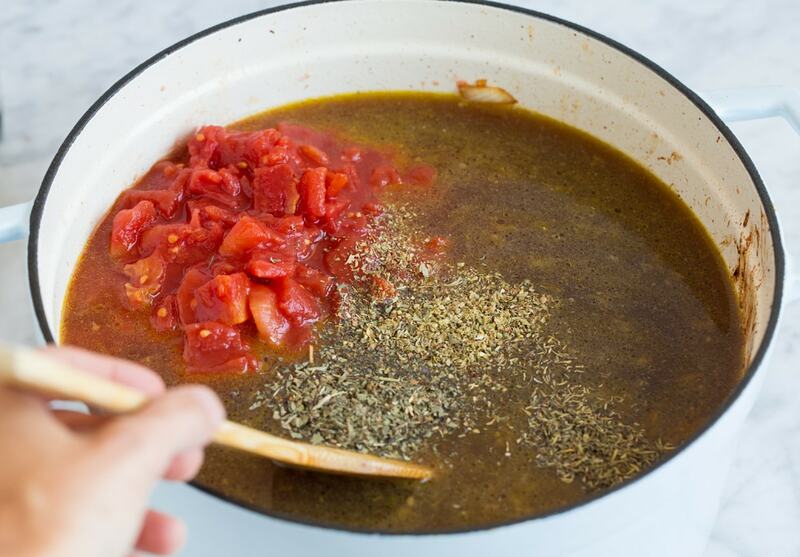 Pour in broth, tomatoes, browned beef, basil, oregano, thyme and season with salt and pepper. 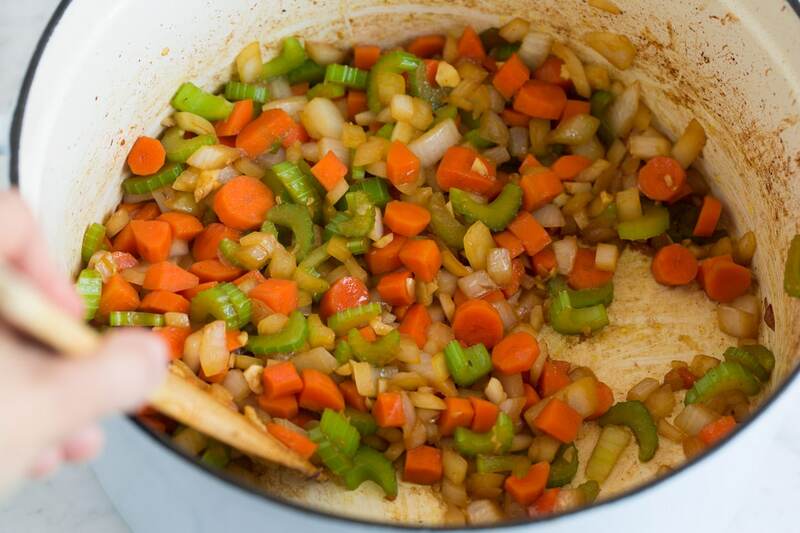 Bring to a boil then reduce heat to low, cover and simmer, stirring once or twice throughout, for 30 minutes. Add potatoes then continue to simmer, covered, 20 minutes (you can also add green beans with potatoes if you like them very soft). 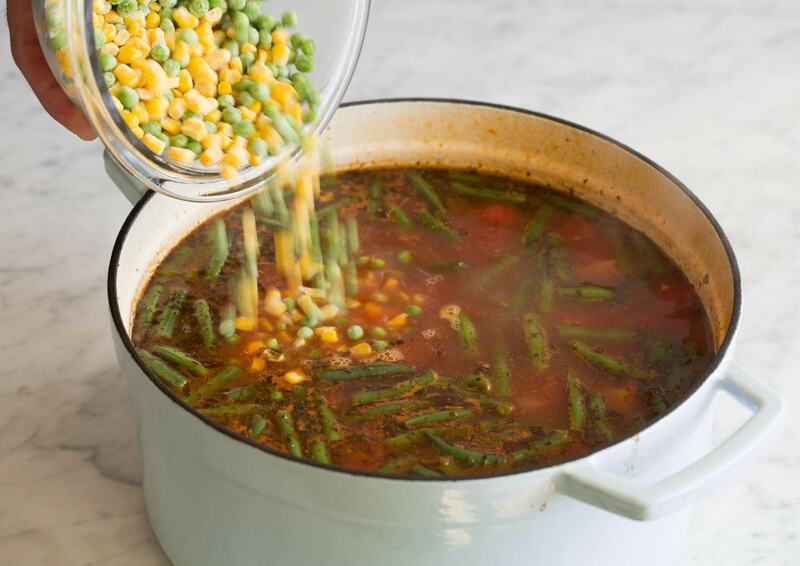 Add green beans and simmer 15 minutes longer, or until all of the veggies and beef are tender. Pour in corn and peas and simmer until heated through, about 5 minutes. Mix in parsley and serve warm with fresh crusty bread for dipping if desired. This can be made in the slow cooker but you’ll still want to start out by browning the beef, then sautéing the carrots, onions, celery and garlic. You’ll pour both of those mixtures into a large slow cooker along with everything else minus the frozen veggies. 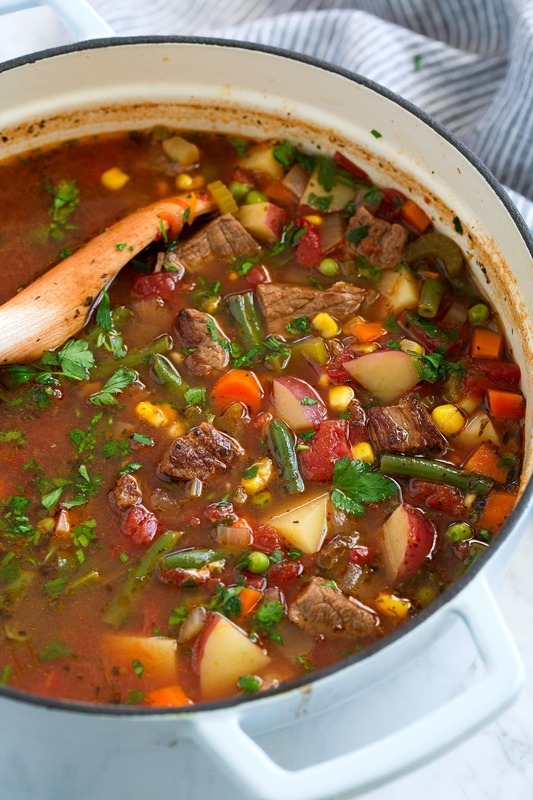 Cook on low until beef and potatoes are tender, about 6 – 7 hours, then add frozen peas and corn and heat through. This is such a versatile recipe. Ground beef could even be use here in place of the beef stew meat. 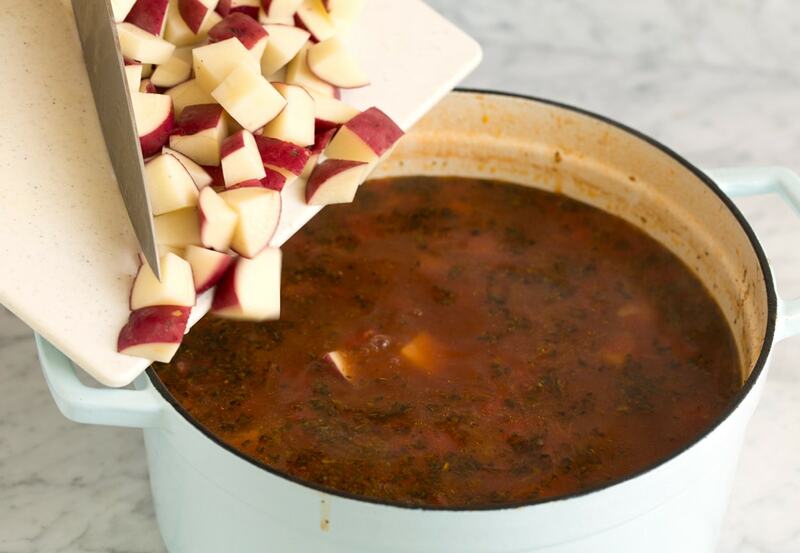 If going that route though you won’t need to simmer as long so skip the first 30 minute simmering and jump right to the step of adding the potatoes. 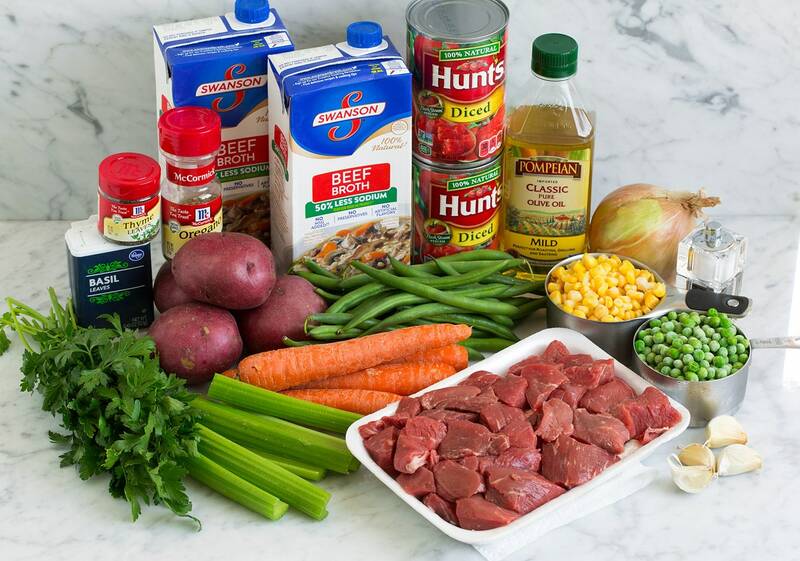 You could also cut up a chuck roast if that’s what’s on sale instead of using beef stew meat. Soup isn't just for the chilly days. 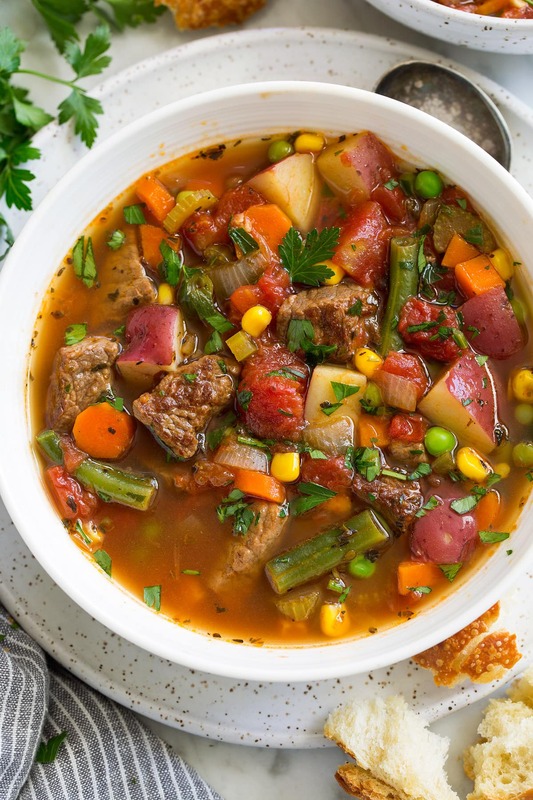 This soup is the perfect way to use up all those summer veggies and those tender chunks of beef add such a delicious flavor. 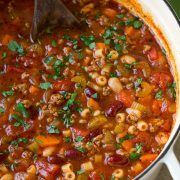 A hearty soup that's sure to satisfy, and you'll love the left overs! Heat 1 Tbsp olive oil in a large pot over medium-high heat. Dab beef dry with paper towels, season with salt and pepper then add half of the beef to pot and brown about 4 minutes, turning halfway through. 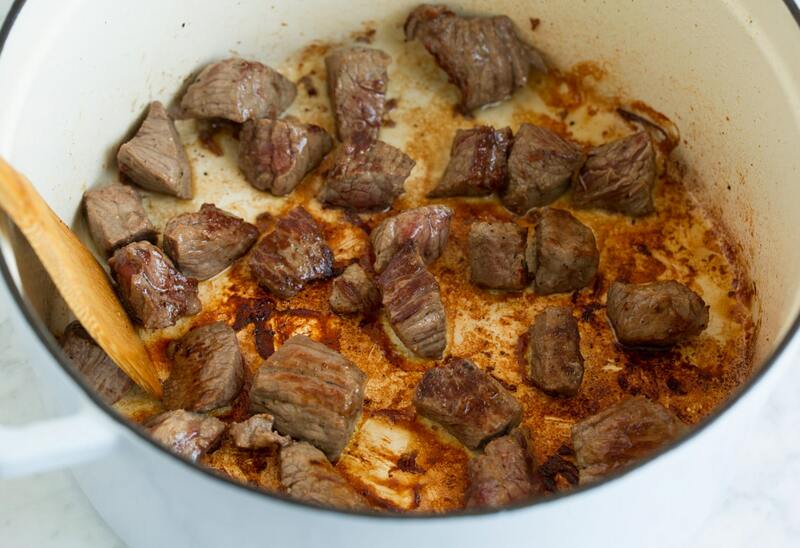 Transfer to a plate add another 1/2 Tbsp oil to pot and repeat process with remaining half of beef. Stir in green beans and simmer 15 minutes longer, or until all of the veggies and beef are tender. Pour in corn and peas and simmer until heated through, about 5 minutes. Stir in parsley and serve warm. *Look for a fatty marbled batch of stew meat, it will be more tender. Dice any larger chunks bite size as needed. **Fresh corn/peas can be used here as well, just add when adding green beans.